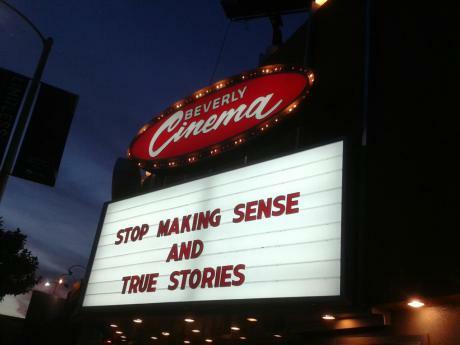 If you don’t live in LA, you’ve probably never heard of the New Beverly Cinema. Even if you do live in LA, you may never have been there. But for a small group of people who love film, the New Beverly has been a home away from home. I think I started going there back in the eighties, when it was run by Sherman Torgan. Sherman died several years ago, and since then his son Michael has taken over. For both of them, running the theatre wasn’t a job, it was an act of love. I’ve seen so many movies at the New Beverly. It’s been so important to my life. These days I don’t go as often as I used to, but I still check in a couple times a year. Not too long ago I saw Reflections in a Golden Eye there. It’s a very interesting and very obscure film, directed by John Huston from a novel by Carson McCullers. I never expected to see it in a theatre, but the New Beverly ran it as part of a Marlon Brando retrospective. I was so happy to see it on the big screen. But it’s not just the programming that makes the New Beverly a special place. It’s special because it’s always been run by people who care about film. Quentin Tarantino has provided support for the New Beverly for years, and actually bought the property when Sherman died in order to keep the theatre alive. I know it means a lot to him. But apparently there’s been a dispute going on about how the New Beverly should be run, and Tarantino has decided he wants to be in charge, effectively taking control of the theatre away from Michael. I just learned of this recently, and I’m not privy to all the details, so I suggest you follow the link below to hear the story from someone who’s been a witness. Ariel Schudson has been part of the New Beverly family for years. Here’s the post she wrote about the situation…. Honestly, I don’t know what to say about all this. I feel like a kid watching Mom and Dad argue. I don’t want to take sides, and the whole thing just makes me feel really awful. I think I was twelve years old when I saw 2001 at the Egyptian in Hollywood. It blew my mind. The movie took me from the dawn of man, to the depths of outer space and beyond the infinite. I’d never experienced anything like it. That was when I started really paying attention to films. I’d already spent a lot of time in movie theatres, but nothing had ever had that kind of impact on me. By the time I was in my teens I was heading out to see films with my friends as often as I could. This was the seventies. Not only was it a great time for movies, it was also a great time for movie theatres. Aside from the Egyptian, in Hollywood alone you had the Chinese, the Paramount, the Pacific and the Pantages. In Century City there was the Plitt, and out in Westwood you had several more. The screens were bigger than ever, and innovations in recording and playback were making sound better than ever. These days I spend a lot of time watching DVDs. I still go to movies, but the convenience of DVDs is hard to resist. You can watch a film any time you want, pause it as often as you want, and if you want to look at something again you just play it over. You also have a huge selection to choose from, whether you’re buying or renting, and some day you may have just as much to choose from via download. We’ve gained a lot in terms of convenience and accessibility. But we’ve also lost something. In fact, we’ve lost quite a lot…. When we’re watching a movie in a theatre, it has our complete attention. We’re sitting in a darkened auditorium facing the screen. Ideally, there are no distractions. At home we’re well aware of our surroundings and there are endless distractions. The phone may ring, somebody may walk into the room, or we may decide to just take a break and raid the fridge. We may or may not be focussed on the film, and we’re entirely in control. We can start and stop any time we like. More important, we’re not experiencing the film the way we would in a theatre. With some exceptions, watching a film in a theatre is very different from watching it on TV, even if your TV is huge and your sound system is killer. 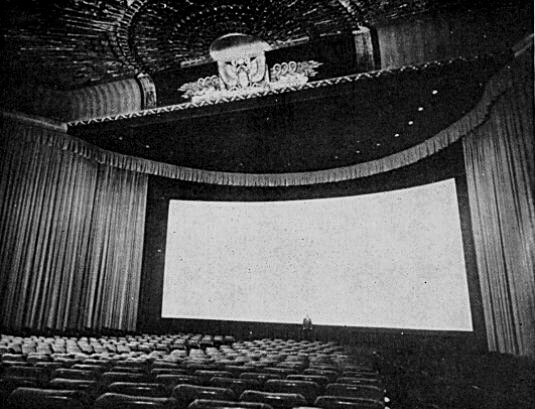 At least until recently, most films were made to be seen on a big screen. Watching 2001 all those years ago, I felt like I was inside the movie. The Searchers is an epic where the landscape plays a major part, and that can only be really felt watching it in a theatre. Even with older films shot in standard format, scale is still important. Stars like Bette Davis and James Cagney were larger than life. Their personalities were powerful enough to fill the big screen. A few more examples…. Part of the beauty of watching Sunrise is being pulled into the swirling expressionist poetry created by Murnau and his collaborators. The film was designed to dazzle the viewer’s senses, to make you feel what the characters are feeling, to make you experience the world through their eyes. This effect can only be diminished by watching it on a small screen. I’ll never forget seeing Bladerunner in Pasadena at the Hastings when it first came out. The film’s vision of twenty-first century Los Angeles was breathtaking, frightening, overwhelming. Skyscrapers towered above me, the city stretched to the horizon, and neon flickered through the haze. Ridley Scott, Jordan Cronenweth and dozens of others knocked themselves out to create those dense, detailed images. Even if you watch it on the largest home screen, you’re getting about eight percent of what you would on the smallest movie screen. P.T. Anderson has gotten a lot of praise for the way The Master looks, but the sound is just as impressive. Footsteps echoing in department stores. Conversations mingling at a posh dinner party. The buzzing of a motorcycle as it cuts through the desert air. Hearing the movie in a theatre, the sound creates space vividly, and much of that will be lost viewing it on your iPad. I’m not arguing that we should give up our TVs, or toss our DVDs and Blu-rays in the trash. What I’m saying is that people who love cinema should not get lazy about seeing movies in theatres. When you watch a film on a small screen you can still enjoy it, you can still be moved by it. But when you watch a film on a big screen in a dark theatre, you can really surrender to it. You let go, and allow it to take you somewhere else. That’s what it means to really experience a movie.